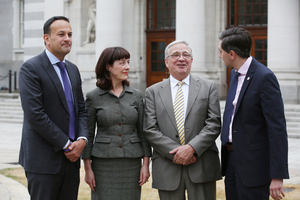 Taoiseach Leo Varadkar and Minister for Health launch the Sláintecare Report and announce the appointment of Laura Magahy, formerly of Temple Bar Properties, as Executive Director of Slaintecare and Tom Keane as chairman of the Slaintecare Advisory Council. The report of the All-Party Oireachtas Committee on the Future of Healthcaret sets out a vision for the future of healthcare over a ten-year period. “Ms Laura Magahy is the managing director of a private sector company, and has been associated with a number of high profile and controversial projects. It is also noteworthy that Ms Magahy’s company, M.CO Projects ltd, has a commercial relationship with the HSE, where for example, it was paid an estimated €2.2m in 2016 by the HSE for consultancy and support services. Posted in Misc and tagged Laura Magahy, Sláintecare at 4:42 pm on July 12, 2018 by Bodger. Are you sure the URL is correct? The usual, taking care of their own. I was going to say “Should it not be someone from the HSE who knows a bit about healthcare” but on reflection there’s nobody in the HSE who fits that description. Not quite fair. Some of the doctors and nurses know quite a bit! 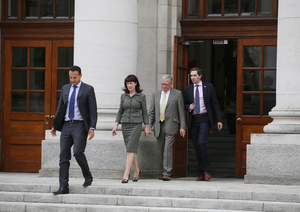 Plus ça change or it looks like Sláintecare is now being run by Bronagh Gallagher. Sláinte indeed in Doheny and Nesbitts tonight. FFS.